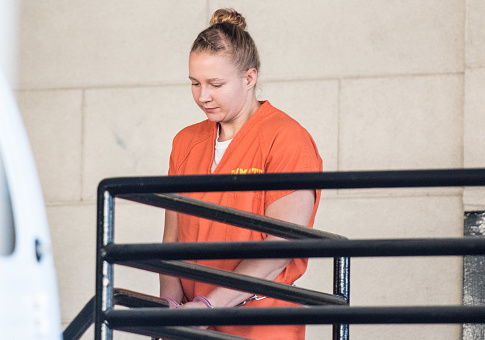 Former National Security Agency contractor Reality Leigh Winner told FBI agents she smuggled a classified document out of a high security intelligence facility in her pantyhose. Winner, accused of leaking a classified report on Russian hacking amid the 2016 presidential election, admitted Wednesday to hiding the document before sending it off to the news outlet the Intercept, Politico reported. A court transcript details the 25-year-old linguist's interrogation. "So how did you get it out of the office?" FBI agent Justin Garrick asked. "Folded it in half in my pantyhose," Winner replied. Winner revealed that she believed the contents of the report, which describe Russian cyberattacks aimed at U.S. voter registration databases, should be available for public consideration. "I saw the article and was like, I don’t understand why this isn’t a thing," Winner said in the interrogation. "It made me very mad … I guess I just didn’t care about myself at that point … Yeah, I screwed up royally." The transcript hints at possible political motivations for the leak, according to Politico. Winner said she objected to her workplace playing Fox News on the TV, and she also said she had a "signed" photo of CNN anchor Anderson Cooper. Although, Winner clarified that the signature was fake. "I wasn’t trying to be a Snowden or anything," Winner said in reference to NSA leaker Edward Snowden, and his disclosure of information on U.S. government and ally surveillance program details. "I guess it’s just been hard at work because … I’ve filed formal complaint (sic.) about them having Fox News on, yo know?" Winner said. "At least, for God’s sake, put Al Jazeera on, or a slideshow with people’s pets. I’ve tried anything to get that changed." This entry was posted in Politics and tagged Al Jazeera, Edward Snowden, FBI, Fox News, NSA, Reality Winner. Bookmark the permalink.